Buckner Rental Service is one of the premier providers of rental equipment to the energy services industry on the Gulf Coast. Hub Associates, a California based private equity firm, negotiated a Letter of Intent to acquire Buckner and was seeking acquisition financing to complete the purchase. After considering the business dynamics of Buckner, including its requirement to acquire additional equipment for lease, a structure was developed to both complete the acquisition and provide for growth capital. 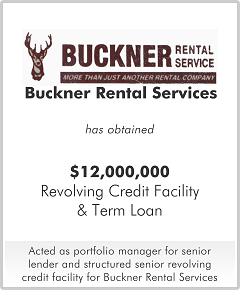 Post-closing, Buckner pursued the acquisition of other rental companies in adjacent markets. Additional capital was provided to complete those acquisitions.